This page displays the results of a statistical ten-year trend analysis developed to use selected water quality parameters from the Water Atlas. This page provides a visualization of the trends indicated by the analysis, a compiled data set, and explanatory digital documents that will be valuable to natural resource managers to characterize water quality conditions and trends. 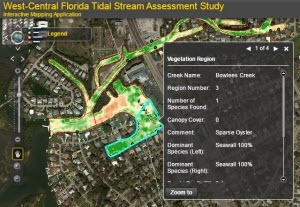 The statistical analytical techniques employed by this tool were modified from the approach used by Janicki Environmental, Inc. in the 2013 Water Quality Data Analysis Report for the Charlotte Harbor National Estuary Program. 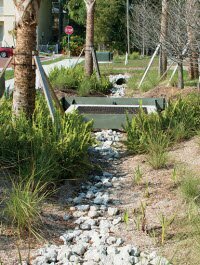 The tool that performed this analysis was developed with funding from the Charlotte Harbor National Estuary Program and The Mosaic Company. 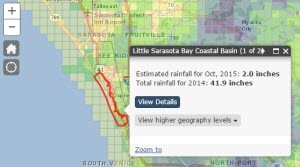 The map below shows the trend being experienced at the long-term monitoring stations spread throughout the Sarasota County area. Note: Trends were prepared on April 23, 2018 using the latest available data. The Seasonal Kendall Tau test for trend available in the EnvStats R package is used as the statistical approach1. The model employs techniques to account for seasonality, autocorrelation and duplicate sampling, in an effort to detect statistically significant trends in the data. 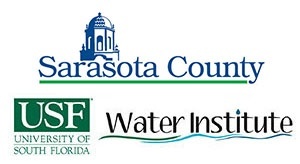 Analysis was performed on three measures of water quality for each of approximately 400 monitoring sites: Total Nitrogen, Chlorophyll a and Dissolved Oxygen concentration. For each site/water quality measure, the analysis determined whether a statistically significant trend was detected, and if so, whether it was increasing or decreasing, weak (<10% change/year) or strong (>10%/year). 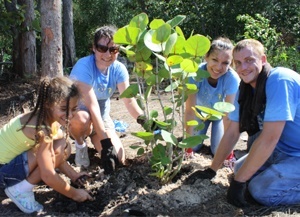 The amount of nutrients entering a water body has important effects on water quality. Plants and animals that live in lakes, rivers and estuaries use these nutrients, especially nitrogen and phosphorus, to grow and survive. However, when excessive amounts of nutrients enter the water, negative impacts can occur, such as algal blooms that block sunlight for submerged plants and trigger events that deplete the oxygen in the water and result in fish kills. Chlorophyll a indicates nutrient enrichment based on the presence of green pigments produced by algae. This page shows trends in Total Nitrogen, Chlorophyll a, and Dissolved Oxygen concentrations as an indicator of the health of our waterways relative to nutrient pollution. An upward trend in Total Nitrogen or Chlorophyll a is interpreted as a decline in water quality, whereas an increase in Dissolved Oxygen concentration is a sign of improving water quality. You can download raw data for your own analysis by clicking on the link below. The data is formatted as a ZIP file containing a Microsoft Access database and multiple PDF maps, and R script.